1 SPEED DATING SESSIONS: fast-paced talk about Free Knowledge! SPEED DATING SESSIONS: fast-paced talk about Free Knowledge! 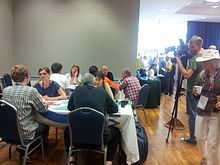 Speed Dating on Free Knowledge was first applied by Wikimedia Deutschland at the Wikimania 2012 in Washington DC and it proved to be a successful conference format. The format enables a fast-paced information exchange about a series of topics and has a high fun factor. The concept of Speed Dating on Free Knowledge is loosely based on the popular concept of speed dating that aims to match people romantically by giving a chance to talk to a number of persons for a short period of time while circulating from one to another. The idea is very easy. To put it short: 4 persons talk to 4 conversation partners for 4 minutes about 4 different topics while rotating from one to another. You need a couple of persons (minimum 4) who are “experts” in their topics from the field of free knowledge. As this format is more meant to be an exchange of opinions than a monologue, they don’t have to be truly experts but more of impulse- setters for a certain topic. The “experts” sit on a long table, each one of them facing a chair that will be filled by a random conversation partner. Then you find a couple of people who would like to take part in the SD (while recruiting them don’t forget to mention that finding the love of your life is NOT the purpose of this game). They take their sit randomly in front of the “experts”. With a sound (e.g. a whistle, clink on a glass, an alarm tone) or just when the moderating person says “Start” these newly formed couples start to talk to each other on the topics. Each talk should last 4 minutes. At the end of each interval, the moderator makes the sound to signal the participants to move to the next “expert”. The SD ends once the participants made a full rotation and came to the point of the beginning - to their first conversation partner. You don’t really need much to get it started. You have to set the time of the talk – a recommendable time interval is 3 or 4 minutes. Face to face, individual conversations. The intervals are not to long so if the topic or person don’t fit the conversation partner, she/he knows that it will last only 4 minutes. On the other hand if the topic or person are extremely interesting the conversation partners can exchange their visit-cards and meet later to have an in-depth talk on the topic. Last but not least: it’s a lot of fun! At Wikimania 2012 we have had 4 persons who sat at 2 long tables, each one facing another empty seat. Each of them had a topic prepared that she/he was good at and had put a piece of paper with the topic on it, so it was clear to the conversation partner what they were supposed to talk about. We had intervals of 4 minutes so that each session took round 20 minutes in total. We also wrote the topics on big blackboards and we placed them in front of the tables so that people felt invited to join the SD. Here's the PDF with our Speed Dating Programme. This page was last edited on 23 July 2016, at 11:46.